The answer appeared in 1990, when myself and the now Professor Camille Parmesan stopped on the spur of the moment at the "Chapel of the Bells" quickie wedding shack in Tahoe. Part-way through his speech the reverend said "in the light of….." and stopped abruptly, evidently forgetting whether we had asked him not to mention God (we hadn't). Collecting his wits, he continued…. "the interconnectedness of all things," causing Camille to collapse in happy laughter. We are ecologists, what could be more appropriate? Plus, we had an answer to gran's question. Of course, butterflies are for discovering the interconnectedness of all things! Not all at once, or we'd be out of work, but at a reasonable pace, in the spirit of which our paper describes research on evolution of diet in Edith's checkerspot butterfly that Larry Gilbert and I began in 1968 as students of Paul Ehrlich at Stanford, and that Camille joined in 1982. My empathy with the shivering tortoisesehells fired an interest in butterflies from the age of nine; an interest renewed by undergraduate lectures on population genetics from E B Ford, who, between bouts of staggering condescension ("as we all learned in our nursery schools, the chi-square-test is used…") explained how butterflies could be useful research tools. My immediate thought was "how much nicer Americans are than the stuffy British!" followed by "Stanford must be no good at all, if you can get admitted by writing a one-page letter." I asked my tutor, who had never heard of Stanford. 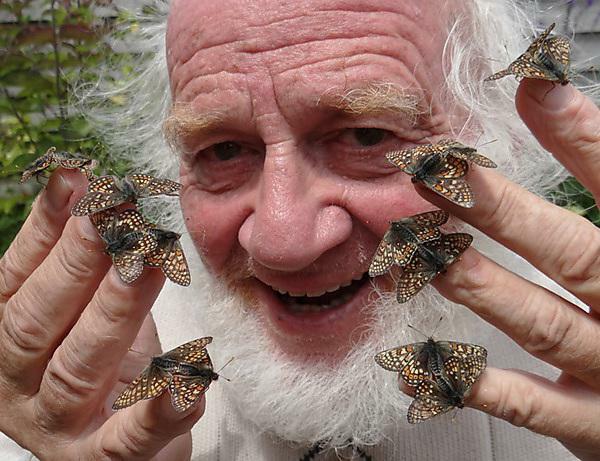 Neither had the next three people I asked, until I came to the aforementioned Larry Gilbert, a Texan butterfly enthusiast spending a one-year Fulbright fellowship in Ford's lab prior to starting a PhD at Stanford with Ehrlich himself. What a happy coincidence! "There's a nutcase in Oxford wants to do that project! Boy, am I going to tie him to that!" As a result of writing that one-page letter, I've spent 50 years studying the interconnectedness of Edith's checkerspot with its host plants. Females choose to lay their eggs on different plants at different sites, even when those sites support apparently identical plant communities. Across those 50 years, we've also observed a temporal pattern: six independent "host shifts," in each of which a butterfly population has changed its diet. The current paper describes just one of those six. The Schneider family, for more than 100 years owners of Schneider's Meadow in Carson City, Nevada, inadvertently set a trap for the butterflies by providing a novel resource, an introduced European plantain, so wonderful that the insects evolved complete dependence on it, whereupon the Schneiders snatched that resource away, causing local extinction of the checkerspots. Evolutionary athletes though these butterflies be, they can't evolve as fast as humans can alter habitats. We’ve also tried to imagine life as a female Edith's checkerspot in Schneider's Meadow, asking herself which of the host-plants she perceives is the "poison'd chalice:" the exotic plantain or her still-available traditional host, Collinsia parviflora. Our study shows that, eventually, all of the butterflies chose the chalice, leading to their demise in 2007-8. A few years later, in 2013-4, checkerspots that had not undergone this bout of anthropogenic evolution recolonised the site and the host shift reversed itself, setting the stage for a potential repeat of the anthropogenic evolutionary cycle. I wish to assert categorically that neither author of the current paper has ever thrown a butterfly in anger. We respect their right to be their wonderful selves. In fact, we like to help them. In apparent recognition of this, my student Chris Thomas (nowadays Chris Thomas FRS) began his PhD defence in the late 1980s with characteristic sarcasm: "When he was twelve, Mike Singer discovered how much nicer it is than sticking pins in butterflies to help them to find places to lay their eggs…" I won't add what he said next, I'll leave it to your imagination. Plymouth offers a friendly, exciting and supportive place to study biological sciences. Our staff are world-leading experts who are passionate and committed to both their research and teaching. Find out more about the areas in which we supervise postgraduate research at both doctoral and masters levels. Here we offer a flavour of potential topics for your own research project and who to contact to discuss your options.